Standing for election for The Boys' Brigade are: Cameron Stein (1st Kirkliston), Shashank Swarna(65th Edinburgh), Alastair Thomson (1st Bearsden) and Christopher Winters (7th Wishaw). "Giving Young People a voice is one of the main aims of the Brigade in Scotland today. We should, as leaders, strive to give our members and voice in their Company, Church, community and nation. 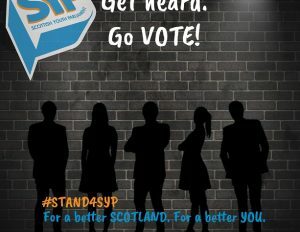 Voting in the Scottish Youth Parliament Elections give our young people that opportunity to use their voice nationally." Information about the BB candidates and how to vote is available here or by contacting the BB Scottish HQ by email or by calling 01324 562008.